An enclave is a territory, or a part of a territory, that is entirely surrounded by the territory of one other state. Territorial waters have the same sovereign attributes as land, and enclaves may therefore exist within territorial waters. :60 An exclave is a portion of a state or territory geographically separated from the main part by surrounding alien territory (of one or more states). Many exclaves are also enclaves. Enclave is sometimes used improperly to denote a territory that is only partly surrounded by another state. San Marino and Lesotho are examples of enclaved states. Unlike an enclave, an exclave can be surrounded by several states. Naxçivan is such an exclave. Semi-enclaves and semi-exclaves are areas that, except for possessing an unsurrounded sea border, would otherwise be enclaves or exclaves. :116:12–14 Enclaves and semi-enclaves can exist as independent states (Monaco, Gambia and Brunei are semi-enclaves), while exclaves always constitute just a part of a sovereign state. A pene-enclave is a part of the territory of one country that can be approached conveniently — in particular by wheeled traffic — only through the territory of another country. :283 Pene-enclaves are also called functional enclaves or practical enclaves. :31 Many pene-exclaves partially border their own territorial waters (i.e., they are not surrounded by other nations' territorial waters). A pene-enclave can also exist entirely on land, such as when intervening mountains render a territory inaccessible from other parts of a country except through alien territory. A commonly cited example is the Kleinwalsertal, a valley part of Vorarlberg, Austria, that is only accessible from Germany to the north. Later, the term enclave began to be used also to refer to parcels of countries, counties, fiefs, communes, towns, parishes, etc. that were surrounded by alien territory. This French word eventually entered the English and other languages to denote the same concept although local terms have continued to be used. In India, the word "pocket" is often used as a synonym for enclave (such as "the pockets of Puducherry district"). 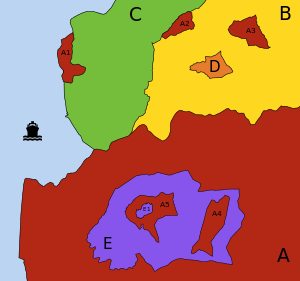 In British administrative history, subnational enclaves were usually called detachments or detached parts, and national enclaves as detached districts or detached dominions. In English ecclesiastic history, subnational enclaves were known as peculiars (see also Royal Peculiar). The word exclave, modeled on enclave, is a logical extension of the concept of enclave. In topological terms, A and E are non-connected surfaces, and B, C and D are connected surfaces. However, C and D are also simply connected surfaces, while B is not (it has genus 2, the number of "holes" in B). Residing in an enclave within another country has often involved difficulties in such areas as passage rights, importing goods, currency, provision of utilities and health services, and host nation cooperation. Thus, over time enclaves have tended to be eliminated. For example, two-thirds of the then-existing national-level enclaves were extinguished on August 1, 2015, when the governments of India and Bangladesh implemented a Land Boundary Agreement that exchanged 162 first-order enclaves (111 Indian and 51 Bangladeshi). This exchange thus effectively de-enclaved another two dozen second-order enclaves and one third-order enclave, eliminating 197 of the Indo-Bangladesh enclaves in all. The residents in these enclaves had complained of being effectively stateless. 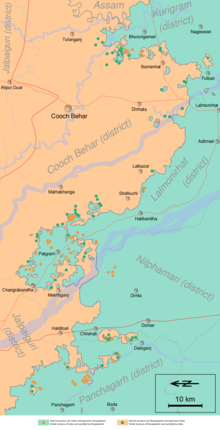 Only Bangladesh's Dahagram–Angarpota enclave remained. An enclave is a part of the territory of a state that is enclosed within the territory of another state. To distinguish the parts of a state entirely enclosed in a single other state, they are called "true enclaves". :10 A true enclave cannot be reached without passing through the territory of a single other state that surrounds it. Vinokurov (2007) calls this the restrictive definition of "enclave" given by international law, which thus "comprises only so-called 'true enclaves'". :10 Two examples are Büsingen, a true enclave of Germany, and Campione d'Italia, a true enclave of Italy, both surrounded by Switzerland. A historical example was West Berlin before the reunification of Germany. Since 1945 all of Berlin was ruled de jure by the four Allied powers. However, the East German government and the Soviet Union treated East Berlin as an integral part of East Germany, so West Berlin was a de facto West German enclave. Also, 12 small West Berlin enclaves, such as Steinstücken, were separated from the city, some by only a few meters. The Principality of Monaco is not an enclave, although it only borders France, because it possesses a coastline and territorial waters. For the same reason, Canada, The Gambia, and Portugal are also not enclaves. Historically, four of the Bantustans (or "Black homelands") of South Africa were granted nominal independence, unrecognized internationally, by the Nationalist government from 1976 until their reabsorption in 1994. Others remained under government rule from 1948 to 1994. Being heavily partitioned, various parts of these Bantustans were true enclaves. 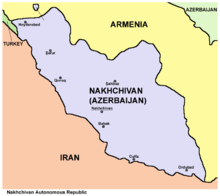 Nakhichivan, which borders Turkey, Armenia and Iran, is an exclave of Azerbaijan. In the United Arab Emirates, four emirates have five true exclaves: Dubai (Hatta), Ajmān (Masfut and Manama), Ras al-Khaimah (the southerly of the emirate's two non-contiguous sections), and Sharjah (Nahwa, also both a true national-level enclave and a counter-enclave). Alaska, one of the United States of America, is the largest semi-enclave in the world. Kaliningrad Oblast is a federal subject of Russia (an oblast), a semi-exclave situated on the Baltic coast. Cabinda (also spelled Kabinda, formerly Portuguese Congo) is a semi-exclave and a province of Angola on the Atlantic coast of southwestern Africa. French Guiana (an Overseas Department), in South America, is a semi-exclave that is bounded by Suriname, Brazil, and the Atlantic Ocean. Pondicherry district, of the Union Territory of Puducherry, is made of 12 non-contiguous parts, many of them true enclaves entirely surrounded by the state of Tamil Nadu. Before Pondicherry, along with the other territories of French India, was absorbed into India in 1954, they were enclaved within the Union of India, and before that the British Raj. Also a legacy of the French colonial period, the Mahe district is made of 3 non-contiguous parts enclaved within the state of Kerala. From 1947 to 1971, Bangladesh was a part of Pakistan as its East Pakistan exclave, separated from West Pakistan by 1,760 kilometers (1,100 miles) of India. In 1971 it eventually gained independence during the Bangladesh Liberation War. The French department of Vaucluse has a rather large exclave to its southeast within the Drôme department — the canton of Valréas (historically known as Enclave des Papes). The term pene-exclave was defined in Robinson (1959) as "parts of the territory of one country that can be approached conveniently — in particular by wheeled traffic — only through the territory of another country. 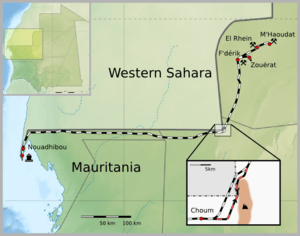 ":283 Thus, a pene-exclave has land borders with other territory but is not completely surrounded by the other's land or territorial waters. :60 Catudal (1974):113 and Vinokurov (2007):31–33 further elaborate upon examples, including Point Roberts. "Although physical connections by water with Point Roberts are entirely within the sovereignty of the United States, land access is only possible through Canada." Pene-enclaves are also called functional enclaves or practical enclaves. :31 They can exhibit continuity of state territory across territorial waters but, nevertheless, a discontinuity on land, such as in the case of Point Roberts. :47 Along rivers that change course, pene-enclaves can be observed as complexes comprising many small pene-enclaves. :50 A pene-enclave can also exist entirely on land, such as when intervening mountains render a territory, although geographically attached, inaccessible from other parts of a country except through alien territory. A commonly cited example is the Kleinwalsertal, a valley part of Vorarlberg, Austria, that is only accessible from Germany to the north, being separated from the rest of Austria by high mountains traversed by no roads. Another example is the Spanish village of Os de Civís accessible from Andorra. The Northwest Angle in Minnesota is geographically separated from the rest of the state (and United States) by Lake of the Woods and is only accessible on land through Canada, via Manitoba. The Romanian village of Nămoloasa (Galaţi county) can be accessed only through Vrancea county (where there is a bridge over the Siret river) because it is separated by the Siret River from the rest of Galaţi county. The village of Kaskaskia, Illinois is separated from the rest of Illinois by the Mississippi River due to a flood in 1881, which shifted the river to flow east of the town, rather than west. This resulted in the only access to the town being from Missouri. Map showing the non-contiguous Belgian exclaves of Baarle-Hertog in the Netherlands which, in turn, has Dutch enclaves within it. The Portuguese town of Estremoz is made up of two civil parishes (freguesias): the small Santo André and the big Santa Maria. Santo André corresponds to the old town (located inside the medieval walls), but excludes the citadel, which is an enclave inside the old town; the citadel belongs to Santa Maria, which also includes the entire new town (outside the walls) and the vast rural area around it. Thus, Santa Maria has an enclave (Santo André, the old town) with a second-order enclave inside it (the citadel). Székely Land is a Hungarian ethnic enclave within Romania, with its people calling themselves Székely. Originally, the name Székely Land denoted an autonomous region within Transylvania. It existed as a legal entity from medieval times until the Austro-Hungarian Compromise of 1867, when the Székely and Saxon seats were dissolved and replaced by the county system. Along with Transylvania, it became a part of Romania in 1920, according with the Treaty of Trianon signed on 4 June 1920 at the Grand Trianon Palace in Versailles, France. In 1938–1940, during World War II, post-Trianon Hungary temporarily expanded its territory and included some additional territories that were formerly part of pre-war Kingdom of Hungary, under Third Reich auspices, the Second Vienna Award. It was later reduced to boundaries approximating those of 1920 by the peace treaties signed after World War II at Paris, in 1947. The area was called Magyar Autonomous Region between September 8, 1952 and February 16, 1968 a Hungarian autonomous region within Romania, and today there are territorial autonomy initiatives to reach a higher level of self-governance for this region within Romania. The 2008 film Silent Light depicts a Mennonite Flemish sect living within the Mexican state of Chihuahua, who speak a dialect called Plautdietsch. Some areas of land in a country are owned by another country and in some cases it has special privileges, such as being exempt from taxes. These lands are not enclaves and do not have extraterritoriality since, in all cases, there is no transfer of sovereignty. The Brest memorial, in Brest, France, has been owned by the United States since the aftermath of World War I.
Victor Hugo's house in St Peter Port, Guernsey, owned by the city of Paris. Pointe du Hoc, 13-hectare site of a memorial and museum dedicated to the World War II Normandy landing at Omaha Beach, transferred by France to American control on 11 January 1979. About 24 m2 (260 sq ft) of land that surrounds the Suvorov memorial near Göschenen in central Switzerland, owned by Russia. The Vimy Memorial in France, which commemorates the Battle of Vimy Ridge. The French government permanently granted a land area of about 91 ha (220 acres) to Canada as a war memorial in 1922 in recognition of Canada's military contributions in World War I in general and at Vimy Ridge in particular. Two cemeteries on the Outer Banks of North Carolina, United States, one on Ocracoke Island and one on Hatteras Island in the town of Buxton, are owned by the United Kingdom. Both contain the graves of British seamen whose bodies washed ashore after World War II U-Boat attacks that occurred on 10 April (San Delfino – one body) and 11 May 1942 (HMT Bedfordshire – 5 bodies). Four graves are at Ocracoke and two at Buxton; three of the bodies were never identified; one of them could be that of a Canadian seaman. The plot of land at Ocracoke "has been forever ceded to England" and is maintained by the U.S. Coast Guard. The plot was leased to the Commonwealth War Graves Commission for as long as the land remained a cemetery. The graves on Hatteras Island are maintained by the U.S. National Park Service. 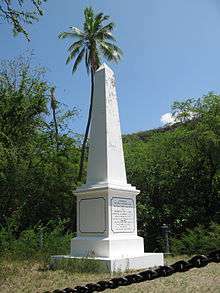 The Captain Cook Monument at Kealakekua Bay and about 25 square feet (2.3 m2) of land around it in Hawaii, United States, the place where James Cook was killed in 1779, is owned by the United Kingdom. An historian on the occasion of the monument's 50th anniversary recorded in 1928 that the white stone "obelisk monument [was] erected to the memory of Captain Cook, about 1876, and on land deeded outright to the British Government by Princess Likelike, sister of King Kalakaua, about the same year, so that that square is absolute British Territory." Hawaii was a sovereign nation at the time. According to a recent writer, "The land under the monument was deeded to the United Kingdom in 1877 and is considered as sovereign non-embassy land owned by the British Embassy in Washington DC. ... the Hawaiian State Parks agency maintained that as sovereign British territory it was the responsibility of the UK to maintain the site." Tihuinza in Peru. Land owned by Ecuador without sovereignty. Argentine Military Cemetery in Falkland Islands. Land owned by Argentina without sovereignty. The land under the John F. Kennedy memorial at Runnymede, United Kingdom was transferred from the Crown Estates to the United States of America by the John F. Kennedy Memorial Act 1964 (an Act of the UK Parliament) however it is in the care of the UK-based Kennedy Memorial Trust. The Tomb of Suleyman Shah (the burial place of Suleyman Shah, the grandfather of Osman I, the founder of the Ottoman Empire) situated in Aleppo Governorate, Syria, is the property of Turkey. Article 9 of the Treaty of Ankara signed between France and Turkey in 1921, provides that the tomb "shall remain, with its appurtenances, the property of Turkey, who may appoint guardians for it and may hoist the Turkish flag there". Salzburg to Innsbruck (Austria) (passes Rosenheim, Germany). A railway line within Austria exists as well, but trains take about 1.5 hours longer than across German territory. Belgrade–Bar railway crosses into Bosnia and Herzegovina for 9 kilometres (5.6 mi), between stations Zlatibor and Priboj (both in Serbia). There is one station, Štrpci, but there are no border crossing facilities and trains do not call at the station. Similarly, during the Cold War, underground lines in West Berlin ran under parts of East Berlin. Ghost stations (German: Geisterbahnhöfe) were stations on Berlin's U-Bahn and S-Bahn metro networks that were closed during this period of Berlin's division. The Belgian Vennbahn (now closed) lies on a narrow strip of Belgian territory running through Germany, creating five German exclaves. In 2009, Russia and Kazakhstan agreed to transfer ownership of a cross-border section of line. In 2013, the shortest railway route from coal mines at Tete to a port at Nacala passes through Malawi. A route through all-Mozambique territory is roundabout. Various roads crossing the border back and forth between the Republic of Ireland and Northern Ireland. The N54 in County Monaghan, Ireland twice becomes the A3 in County Fermanagh, NI, before continuing as the N54. Similarly, the N53 in Monaghan passes through County Armagh, NI as the A37, before resuming as the N53 at the border between Monaghan and County Louth, Ireland. No national or county border signs are present. The D8 coastal highway of Croatia passes through a small section of Herzegovina territory, at the Herzegovinian town of Neum, as it heads south from Split to Dubrovnik. The Hong Kong–Shenzhen Western Corridor on the Hong Kong–mainland China border: the immigration control points for Hong Kong (Shenzhen Bay Control Point) and mainland China (Shenzhen Bay Port) are co-located in the same building on the Shenzhen side of the bridge. The Hong Kong portion of the service building and the adjoining bridge are leased to Hong Kong, and are under Hong Kong's jurisdiction for an initial period until 30 June 2047. 1 2 Raton, Pierre (1958). "Les enclaves". Annuaire français de droit international. p. 186. 1 2 3 Melamid, Alexander (1968). Sills, David, ed. "Enclaves and Exclaves". International Encyclopedia of the Social Sciences. 5. The Macmillan Company & Free Press. 1 2 3 4 Rozhkov-Yuryevsky, Yuri (2013). "The concepts of enclave and exclave and their use in the political and geographical characteristic of the Kaliningrad region". Baltic Region (2): 113–123. doi:10.5922/2079-8555-2013-2-11. 1 2 3 4 5 6 7 8 9 10 11 12 13 14 Vinokurov, Evgeny (2007). The Theory of Enclaves. Lexington Books, Lanham, MD. 1 2 Robinson, G. W. S. (September 1959). "Exclaves". Annals of the Association of American Geographers. 49 (3, [Part 1]): 283–295. doi:10.1111/j.1467-8306.1959.tb01614.x. JSTOR 2561461. 1 2 Le Grand Robert, Dictionnaire de la langue française, 2001, vol.III, p. 946. ↑ Servitude: Law. A right possessed by one person with respect to another's property, consisting either of a right to use the other's property, or a power to prevent certain uses of it. Webster's, p. 1304. ↑ "Government Jobs in BSNL : 01 Jobs Opening". jobresultsnic.in. Retrieved 2014-02-24. ↑ As can be seen on 18th. century maps of Germany and other European countries by British cartographers and publishers such as R. Wilkinson. ↑ Exclave. Webster's, p. 497. ↑ "Berlin Exclaves". Retrieved 2013-05-02. ↑ "Uncertain future for Camp Zeist". BBC News. 2002-03-14. Retrieved 2011-01-30. The former military base at Camp Zeist in Holland has been under Scottish jurisdiction for more than three years. The base was converted into a prison and a courtroom to provide the venue for the Lockerbie trial – the largest and most expensive ever conducted under Scots law. ↑ "Assembly of Turkish American Associations". Ataa.org. Retrieved 2014-02-24. ↑ Vinokurov (2007), p. 29, also refers to semi-exclaves as a type of "mere exclave with sea connection to the mainland." ↑ "Map showing the existing police station limits". Retrieved 2013-09-30. ↑ Melamid (1968) states, "Contiguous territories of states which for all regular commercial and administrative purposes can be reached only through the territory of other states are called pene-enclaves (pene-exclaves). These have virtually the same characteristics as complete enclaves (exclaves)." 1 2 Catudal, Honoré M. (1974). "Exclaves". Cahiers de géographie du Québec. 18 (43): 107–136. doi:10.7202/021178ar. ↑ No. 203 of 1993: Transfer of Walvis Bay to Namibia Act, 1993. ↑ "Jervis Bay Territory Governance and Administration". Although the Jervis Bay Territory is not part of the Australian Capital Territory, the laws of the ACT apply, in so far as they are applicable and, providing they are not inconsistent with an Ordinance, in the Territory by virtue of the Jervis Bay Acceptance Act 1915. The Department of Regional Australia, Local Government, Arts and Sport. Retrieved 17 January 2013. ↑ "Google Maps route out of the county from one point on the county border to the other here". ↑ Arocha, Magaly (May 1999). "La Orden de Malta y su Naturaleza Jurídica (The Order of Malta and Its Legal Nature)". Caracas, Distrito Capital, Venezuela: Analítica.com. Retrieved October 1, 2012. ↑ "Notification of the Ministry of Transport and Communications of the Czech Republic". 20 August 2001. Retrieved 2013-10-26. ↑ Siebeck, Jürgen (23 October 2002). "Is Bohemia the sea?". Retrieved 2013-10-26. ↑ Vališ, Zdeněk (28 April 2005). "Czech harbor in Hamburg, waiting for resurrection". Retrieved 2013-10-26. ↑ "Czech leased areas in Hamburg and Stettin". Retrieved 2013-10-26. ↑ "The Transport Agreement between the Czechoslovak Republic and the Polish People's Republic of 13 January 1956". Retrieved 2013-10-26. ↑ "domaines français de Sainte-Hélène". Domfrance.helanta.sh. Retrieved 2012-09-02. ↑ "Guernesey : Hauteville House". Paris.fr. 2012-08-28. Retrieved 2012-09-02. ↑ "The American Battle Monuments Commission". "The site, preserved since the war by the French Committee of the Pointe du Hoc, which erected an impressive granite monument at the edge of the cliff, was transferred to American control by formal agreement between the two governments on 11 January 1979 in Paris, with Ambassador Arthur A. Hartman signing for the United States and Secretary of State for Veterans Affairs Maurice Plantier signing for France". Retrieved October 29, 2012. ↑ "Canada And Vimy Ridge – Background Information – Veterans Affairs Canada". Retrieved 2012-04-09. ↑ Hickam, Homer H. (1996). Torpedo Junction: U-Boat War Off America's East Coast, 1942. Naval Institute Press. pp. 202–207. ISBN 1-55750-362-1. 1 2 "British Cemetery at Ocracoke, North Carolina". Retrieved 2013-02-24. ↑ "Historic Ocracoke Village – A Walking Tour". Retrieved 2013-02-24. ↑ "British Cemeteries". Retrieved 2013-02-24. ↑ Erickson, Lt Clayton, RCN (2012). "Captain Cook Monument at Kealakekua Cleaned and Repaired". Cook's Log. 35 (4). p. 38. Retrieved 2013-02-23. ↑ "Canadian Crew Cleans Cook Monument". 30 August 2012. Retrieved 2013-02-23. ↑ Harris, Francis (22 Jul 2006). "Don't mention the murder – how Hawaii forgot Capt. Cook". The Daily Telegraph. London. Retrieved 2013-02-23. ↑ Taylor, Albert P. "HOW HAWAII HONORED CAPTAIN COOK, R.N., IN 1928". p. 29. Retrieved 2013-02-23. ↑ MacFarlane, John M. (2012). "The Captain Cook Memorial at Kealakakua Bay Hawaii". Retrieved 2013-02-23. ↑ "John F. Kennedy Memorial Act". Google docs [unofficial copy]. Retrieved 2012-06-16. ↑ "Franco-Turkish agreement of Ankara" (PDF) (in French and English). Retrieved 8 August 2014. ↑ "Driving directions". Google maps. Google. Retrieved 21 May 2015. ↑ "Senegal may tunnel under Gambia". BBC News. 2005-09-21. ↑ "Office of The Gambian President: State House Online: Yahya A.J.J. Jammeh". statehouse.gm. 1 2 Bessert, Christopher J. "Highways 20–29". Wisconsin Highways. Retrieved July 7, 2011. ↑ Riner, Steve. "Details of Routes 1–25". The Unofficial Minnesota Highways Page. Retrieved July 7, 2011. ↑ "Map of Douglas County, Wisconsin" (PDF). Retrieved 2014-09-08. ↑ Railway Gazette: Border bridges rebuilt Archived May 3, 2008, at the Wayback Machine. ↑ The log of the Water Lily, p. 84. Books.google.com. Retrieved 2014-02-24. ↑ "Ihr Bahnhof Basel Bad Bf" (PDF). Archived from the original (PDF) on 2007-09-30. Retrieved 2013-02-26. 1 2 "From The Straits Times Archives: Malayan Railway land in Singapore". The Straits Times. 31 October 2014. Retrieved 26 February 2015. ↑ "KTM Tg Pagar station will move to Woodlands in S'pore July 1, 2011 (Update)". The Star (Malaysia). 24 May 2010. Retrieved 26 February 2015.